Trench Collection by Sonia Verardo: Best Concealers Ever! Today I'd like to share with you my all time favourite concealers! What are they special for? Erase Paste is truly an industrial strength concealer! It will cover up just about anything, from pimples, redness, discoloration, to other types of imperfections. However I wouldn't use it for under my eye area, as I find it can get a bit cakey and accentuate the fine lines, and we definitely don't want our concealer to do that! My favourites, besides the Erase Paste, are boi-ing concealers, which in the kit you'll get two, in both shades (01 and 02). Kiko Make Up Milano 3D Lifting Concealer is a great stuff to put in your under eye area, especially if you had a long day at work, or just a restless night! It's, as the name says, a lifting effect fluid concealer. It contains the lifting complex K2 Bi-lift, squalene of plant origin, a mix of draining active ingredients and soft focus agents that provide even- toned complexion and radiant finish for a long time. It's hypoallergenic, formulated to ensure minimum instance of allergic reactions. It's easy to use: Just apply to the eye contour area and to expression wrinkles to smooth and to illuminate the face! Estée Lauder Double Wear Stay-in-Place Flawless Wear Concealer is one of my beauty must haves, but it acts pretty much as a Kiko 3D concealer, so I like to say it's a more expensive version of that concealer. It is on the expensive side, but it's very concentrated, so a few little dots of it will go a long way. It really will last you a long time, even with every day application! As the Kiko one, this too contains SPF 10. I use it in a shade 01 light. This concealer will provide you a flawless look and it lasts a whole day, even up to 15 hours, so you don't need to worry about constantly reapplying it! Feels lightweight and never dry, which is a very positive thing if you're putting it on your under eye area, because it won't be cakey, or accentuating your fine lines! It stays seamless, without creasing, througout the day. Manhattan Cover Stick is another one of my must- have concealers. My skin tends to be oily, with occasional breakouts, so I always need to have a specific concealer to cover up my blemishes. When I'm looking for a concealer that would cover up my breakouts, I don't just look for a great coverage, but I always have in mind that it needs to have an anti-inflamatory properties, that will make the blemish dry out faster, and it won't additionally clogg my pores. Manhattan Clearface is the line I have been using ever since high- school! This antibacterial cover-stick offers reliable coverage for impurities without blocking the pores. Effectiveness and tolerance have been dermatologically confirmed. It's also waterproof. Currently I've tried this new version of Manhattan clearface concealer, with a core of active ingredients for an even better anti- spot effect! The highly concentrated active ingredients at the core support the other active ingredients already present in the cover- stick. The skin becomes visibly clearer. Maybelline The Eraser Eye Perfect & Cover concealer is the concealer I raved & raved about. It contains goji berry and haloxyl, for an instant anti-aging effect. I've been using this concealer in many of my make up tutorials and in every day make up routine. I like to use it as a highlighter, and I find that the shade FAIR is the most flattering for me. Garnier Roll- on Anti-dark circles is probably the oldest concealer currently in my collection! Even though I've been using it every single day, ever since I bought it, I still have a good amount of it left. It's supposed to act as an anti-dark circles concealer, but as I fortunately don't suffer from that problem, I don't know if it works for that or not. I like it because of it's hydrating and cooling effect (thanx to the metallic roller-ball). I wouldn't use this concealer for any other parts of my face except my under eye area, just because it's quite liquid-y so it won't cover any breakouts or blemishes. Last, but not least, the Bourjois healthy mix concealer, is the newest concealer in my collection. I liked the idea of a "fruit therapy" and the mix of apricot and raspberry ingredients that it has. The apricot should provide radiance to your skin, and the raspberry is known as a micro- circulation activator. It'll bring radiance to your face and provide an anti- fatigue effect. 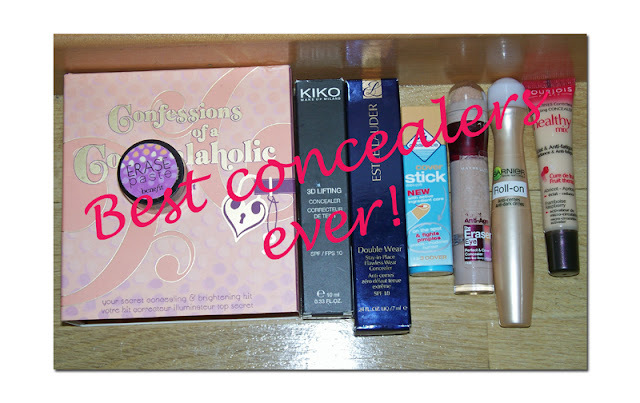 Those were the concealers I wanted to mention as my favourites! Have you tried any of these concealers and if so, what was your opinion on it? Do you have some other concealer that you consider a must-have, that I haven't mention, and you would like to recommend it to me? Leave me your replies in the comment's section! Thanx for stopping by, I hope this review was helpful!